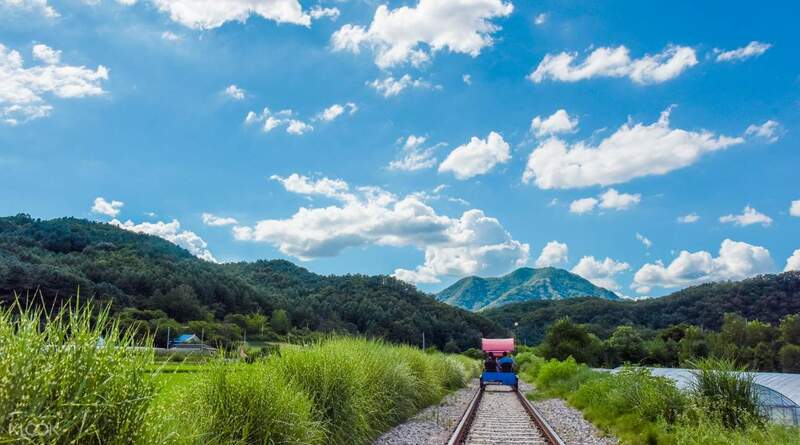 Climb aboard the old train tracks and experience an exciting bike ride in the beautiful countryside of Gangwon-do! Fun ride! no hassle to redeem ticket! highly recommended. 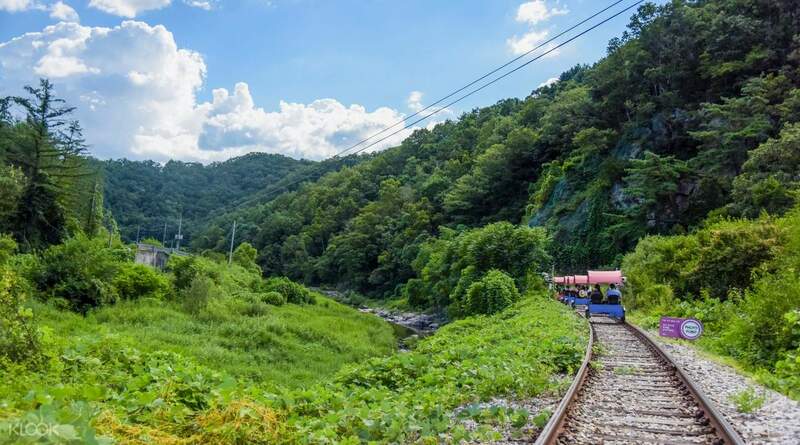 The Gangchon Rail Bike is a popular activity on Nami Island, allowing visitors to pedal along the old Gangchon Rail Park track while taking in the scenery of the lovely 318km Bukhangang River. You will be able to experience a piece of history when you travel the same route the Mugunghwa train traveled for a span of 70 years! 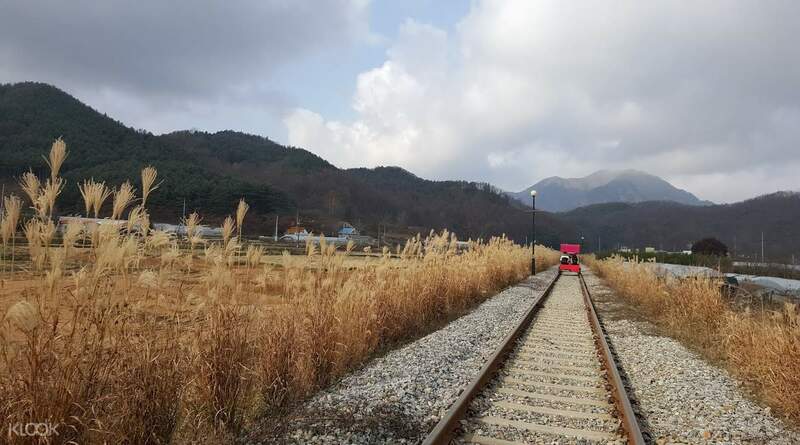 The Gimyujeong Station course is approximately 8.5km long with the first section (6km) lasting around 50 minutes. After riding the first 6km you will arrive at a transfer station where you will be able to take a bathroom break or pick up a snack from the cafeteria. From there continue on a 20 minute romantic train ride so you are not required peddle! Once you arrive at the Gangchon Station make sure to grab the free shuttle back to where you started. The place was easy to find and redemption of ticket is easy. We miss our first timing, hence we have to wait for the alternate time. The view is very nice but it was too cold to cycle in the winter season. But overall we had so much fun. The place was easy to find and redemption of ticket is easy. We miss our first timing, hence we have to wait for the alternate time. The view is very nice but it was too cold to cycle in the winter season. But overall we had so much fun. Quick confirmation after I booked the ticket. Ticket redemption is also easy at the ticket counter. Just have to show the staff your Klook confirmation voucher on your phone. My children enjoyed the ride so much. Quick confirmation after I booked the ticket. Ticket redemption is also easy at the ticket counter. Just have to show the staff your Klook confirmation voucher on your phone. My children enjoyed the ride so much. It was very worth it buying through klook. The price was RM90 for a carriage for 2 person. If bought on the spot it would be 30,000won which is equivalent to about RM120. It was raining on the day of our trip however the ride proceeded as per timing. The rail bike last for 90mins. And then you will transfer to another train for scenery all the river. The train ride last 30mins. So all in is 2hours. Pls take note that the start point and end point is different therefore a bus ride to return to original point is provided after the activity. Overall it was a great and seamless experience. It was very worth it buying through klook. The price was RM90 for a carriage for 2 person. If bought on the spot it would be 30,000won which is equivalent to about RM120. It was raining on the day of our trip however the ride proceeded as per timing. The rail bike last for 90mins. And then you will transfer to another train for scenery all the river. The train ride last 30mins. So all in is 2hours. Pls take note that the start point and end point is different therefore a bus ride to return to original point is provided after the activity. Overall it was a great and seamless experience. We really enjoyed this!! And the super cute tunnels!! But if you go durig winter months, be sure to bring scarf for your face and glove for your hands!! The wind can be super cold esp in the evening. We took the 4.30pm slot and just in time to catch the sunset. It was super dark after we finished, so don't go for 5.30pm slot during winter months! After you finish the rail bike, the train brings you to Gangchon town to catch the shuttle bus back to the park. It's a bit of a walk w/o enough signage tbh.. but follow the crowd and you should be fine! We really enjoyed this!! And the super cute tunnels!! But if you go durig winter months, be sure to bring scarf for your face and glove for your hands!! The wind can be super cold esp in the evening. We took the 4.30pm slot and just in time to catch the sunset. It was super dark after we finished, so don't go for 5.30pm slot during winter months! 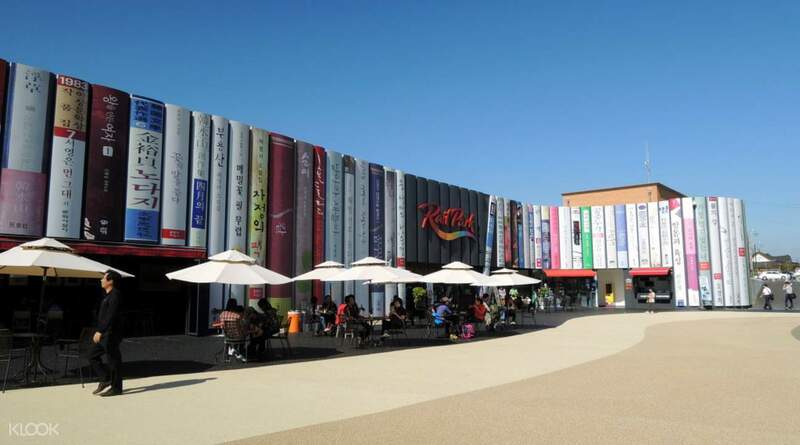 After you finish the rail bike, the train brings you to Gangchon town to catch the shuttle bus back to the park. It's a bit of a walk w/o enough signage tbh.. but follow the crowd and you should be fine! The activity was fun and exciting, especially to be cycling in the cold weather. Something different to try out on a trip. Get to test your teamwork skills. Fun songs played in the tunnel. The scenery while cycling was amazing. The romantic tour after the activity was amazing. Got to buy dal.komm coffee after the activity. The activity was fun and exciting, especially to be cycling in the cold weather. Something different to try out on a trip. Get to test your teamwork skills. Fun songs played in the tunnel. The scenery while cycling was amazing. The romantic tour after the activity was amazing. Got to buy dal.komm coffee after the activity. One of the best back to nature activity. Loved the rides with awesome view along the journey and tons of surprise crossing the tunnels. If you are nature, green, relax and wish to let your hair down type, this is one not to be missed! One of the best back to nature activity. Loved the rides with awesome view along the journey and tons of surprise crossing the tunnels. If you are nature, green, relax and wish to let your hair down type, this is one not to be missed! Fantastic experience! Relaxing and fun ride through the rice fields and mountain tunnels. Some tunnels are even equipped with music and lights! It is not very tiring as the carriage will roll itself even though you are not pedalling. Be prepared to take alot of nice photos. Fantastic experience! Relaxing and fun ride through the rice fields and mountain tunnels. Some tunnels are even equipped with music and lights! It is not very tiring as the carriage will roll itself even though you are not pedalling. Be prepared to take alot of nice photos.